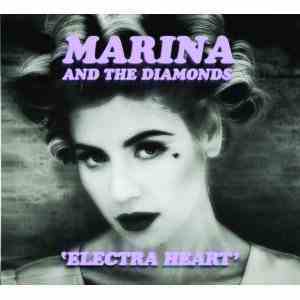 Electra Heart is the new music album from Marina and the Diamonds. It was released in two varieties on April 30th, 2012. The standard album version consists of 12 songs, while the delux album version includes an additional 4 bonus tracks. This page lists the songs from the album, with the hope that they will be picked up by Google for use as a Rich Snippet, using the rich snippet music mark up. If your web browser supports it, you’ll also be able to sample songs from the album. When you select a sample, the audio player will appear at the top of the album list, and disappear when the sample has ended. For more information about Marina and the Diamonds, check out her official web site. *Reached number 11 in the UK Singles Chart, and number 9 in the UK streaming chart. *Reached number 193 in the UK Singles Chart. I had the pleasure of seeing Marina and the Diamonds perform in Nice, France (French Riviera) this past week at the Stade Charles Ehrmann (Palais Nikaia), a French event stadium. Along side Rita Ora, Marina has been supporting Coldplay on some of their concerts, and so here is a little video of what she can offer an audience. Live Performance at T4 on the Beach 2012 in Weston-Super-Mare, Somerset, England.